Bitte hier für eine Deutschsprachige Version anklicken! Last weekend, R-KOM and the University of Applied Science (Fachhochschule, FH) Regensburg, Germany, took their share of the Regensburg city marathon by putting a video and image of each runner reaching the goal on the Internet. A cluster of 45 machines from the Fachhochschule Regensburg computed over fivethousand films. 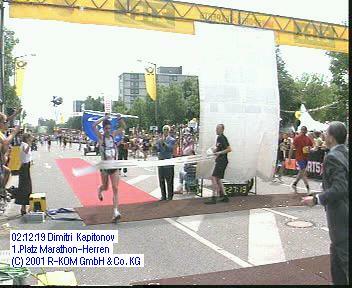 Being a sponsor of the Sports Experts Marathon, R-KOM contributed once more by putting the video and images of each runner completing the course up on the Internet. Due to increased demands on quality, the company's machines were not fast enough to reach the goal in a reasonable amount of time. Due to contacts to the Fachhochschule Regensburg, a collaboration was made, and the department of computer science offered a sufficient number of machines as well as support setting them up. The Fachhochschule Regensburg provided 45 machines, including installation and management of the nodes, data storage, and also helped optimizing and tuning the Unix-based software created by employees of R-KOM based on freely available components. The software consists of components to split video streams into single pictures as well as computing video sequences from single pictures based on the time of arrival of each runner. A fully automated, scriptable processing was important here for the 5500 runners reaching the goal. Preparations of the Regensburg Marathon Cluster started on early saturday evening by preparing the cluster machines under supervision of Hubert Feyrer of the computer science department of the Fachhochschule Regensburg as well as several students, who helped deploying the machines. Adjusting and tuning the cluster software took the rest of the pre-marathon evening. After the last runner reached the goal on Sunday afternoon, processing of the video material provided by the local TV company TVA started under the supervision of Jürgen Mayerhofer, R-KOM. 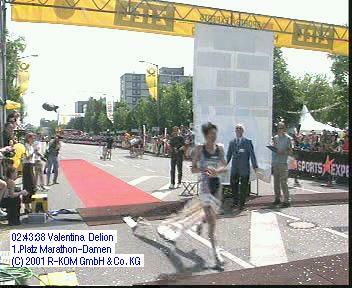 The material was used to render video sequences and pictures of each runner's completion of the course. Using NetBSD, a Unix/Linux-like operating system Open Source, in a cluster setup and the help of further Open Source software which was used to control and calculate the MPEG-animations of the marathon videos and pictures gave a solid base for a software project of this size. This page has been accessed 81074 times.